Lambert Tower, at the cliff’s edge in the eastern part of the reservation. It’s been a busy summer. Done a little more (well, maybe a lot more) hiking, done a little more geocaching, contributed my first column to the New York-New Jersey Trail Conference’s newsletter, Trail Walker – can’t resist a little humblebrag there – and added a few more spots to my must-hike-in-at-least-once list. 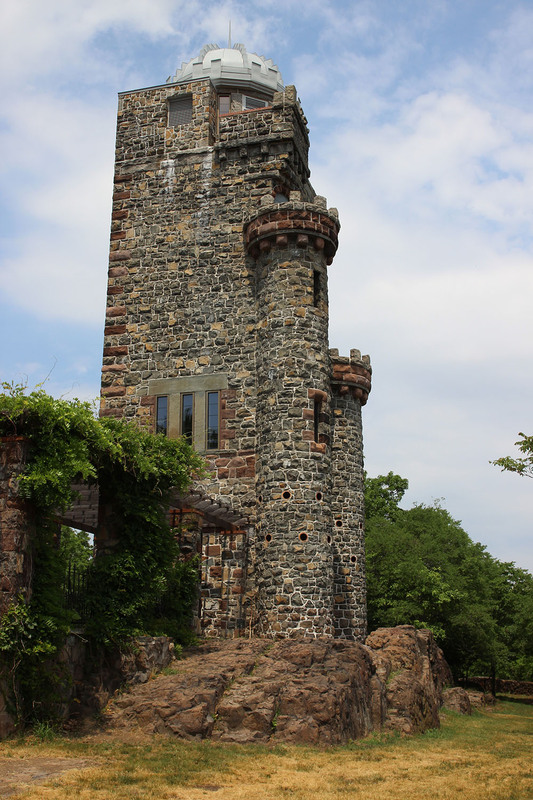 And speaking of that list, I finally scratched another place off the list back in late spring when I wandered up to Garret Mountain Reservation in Woodland Park (formerly West Paterson – it’s a long story) for an afternoon’s worth of ambling atop the Watchungs. For hiking purposes, Garret Mountain has two blazed trails, a series of unmarked trails and woods roads that criss-cross through the middle of the park, and Benson Drive: a long ring road that goes around the park perimeter. The yellow-blazed trail is a couple of miles long, and I’d give it a grade of moderately difficult – there’s one stretch toward the northern end of the park that involves some huffing and puffing up some switchbacks. But it’s a good trail to take if you want a grand tour of the park. The eastern loop of the trail goes along the ridge of the mountain – since it’s not really beneath the treeline, I strongly suggest bringing sunscreen and a hat. But this is where you get the really awesome panoramic views – there’s Paterson and Interstate 80 off to the immediate northeast, and then farther off to the east, of course, is New York. View from the ridge over Barbour’s Pond. So, basically the eastern side of the trail has most of the photo-op stuff. But meanwhile, off to the west, the trail takes you past Barbour’s Pond. I saw a lot of people out on the edges of the ponds with fishing poles, and there’s a rocky ridge that takes you up and over the pond’s edge (good place to sit and bask for a bit). And at that time of the year, the surface of the pond near the shoreline was thick with lily pads. Local fauna: You’ll find deer, and the occasional wild turkey – not to mention the horses in residence at the equestrian center (some of the trails are designated bridle paths). I noticed that there were quite a few bird watchers out taking the woods when I was there in late May. I asked one of them what some of the bird species they were spotting up there were; they mentioned orioles and warblers, among other species. I myself spotted one or two red-winged blackbirds, plus one yellow-orange bird that I now believe was an oriole. I’ve hinted at a few things that I wasn’t able to check out, but might want to in the future. There could be a few more blog postings out of this patch of turf on the Watchungs, besides a visit to Rifle Camp Park or to the castle – so as ever, trail heads, stay tuned.